World War is another addition to the long list of Facebook rpg games and this one has a modern wartime setting. You can complete missions to earn money, gain experience and level up so you can access more content in the game. Some missions will require you to buy things from the game store such as soldiers or ships to complete the mission. You can do whatever mission you want but you must master them before other areas of the game will be unlocked. In World War players can also complete against other Facebook players in the battle mode. Players can own buildings such as bunkers which will increase their daily cash totals. 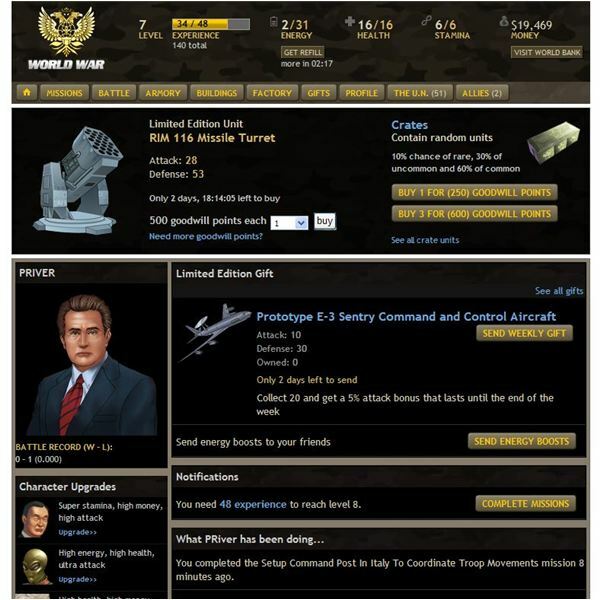 Players can build units in the factory to sell for “goodwill points” which can be used to purchase special items. 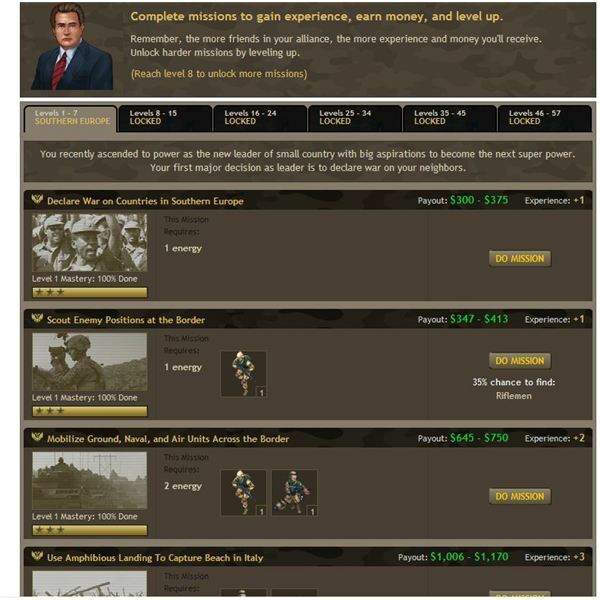 To complete most missions you will need to purchase equipment in the armory such as additional soldiers, and transports. During some missions there’s a chance you’ll loot equipment that you can use. Each mission will grant you experience and cash. As you reach higher levels new missions will unlock for you to complete. Overall it’s the standard mission fare in other Facebook RPGs such as Band of Heroes. While the game features a lot of different missions, they just aren’t very entertaining. The text and graphics are rather bland. Players can compete against other Facebook users in the game. Your Facebook friends become part of your alliance and can help you win battles. Your success in battle also depends upon the equipment you have such as soldiers and your profile statistics. When you take part in battles you’re matched up with players at your current level for fairness in the game. You’ll earn goodwill points as you level up. Theses can be used to purchase exclusive items in the game like energy upgrades. These items will take quite a few points so you can construct items such as mines and tanks in the factory. These items will take time to construct but if you don’t collect them in time you lose the points created. Another downside to goodwill points is it takes a whole bunch of these points to purchase anything. You can also buy these points with real life cash. World War isn’t a very engaging game and it lacks the graphics and detail to keep it interesting for most people. Many new Facebook Rpgs are moving away from standard text and graphics. This game could benefit from some more graphic elements, or sound. On the plus side there are plenty of missions and things to buy in the armory. Hopefully more will be added to this game but it just can’t compete with a title such as Mafia Wars at this time. It is still recommended if you like war themed rpgs and want a change of pace to your Facebook RPG gaming.